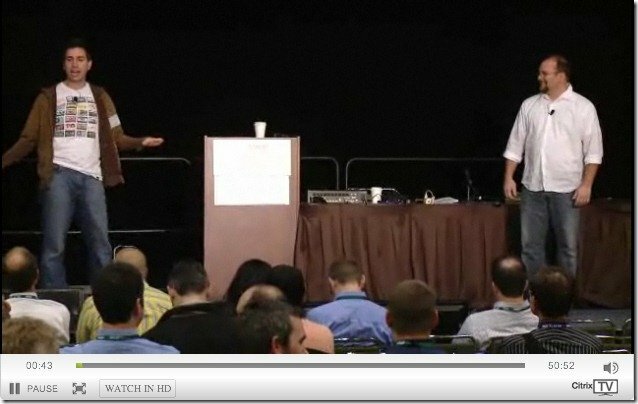 At Citrix Synergy last month, Gabe and I gave a joint session titled "15 Reasons Desktop Virtualization Fails." We had a good crowd in the session with us, but fortunately Citrix recorded the session and has posted the full 50-minute video over at Citrix TV. Gabe and I had a lot of fun with this session (especially trying to limit our reasons desktop virtualization fails to just 15! :) Our idea was that sharing the reasons that real-world projects failed would help you avoid these problems in you own environment. The companion slide set is available as a PDF (4.4mb).